I should have gotten this post up for you all, but I guess better late than never. I spent the second day of the beta just running around and looking at everything. I made a character of each race, and I have to say I’m very impressed with how each area feels different, and matches the racial history and culture that they have created for this world. I didn’t want to play too far into the story, I’ll just have to do it again when the game releases, so I spent a lot of the time checking out the sights, looking at new features, and getting a feel for the game. I was blown away by the scenery from day one, but the city and its features really took my breath away. From a game development standpoint cities are hard to do, and make to feel alive. You want to make this big city, with a believable population of NPCs that serve no purpose other than window dressing. You have to get in the sights and sounds of a bustling market, when most of it won’t even be used by the player or his character. 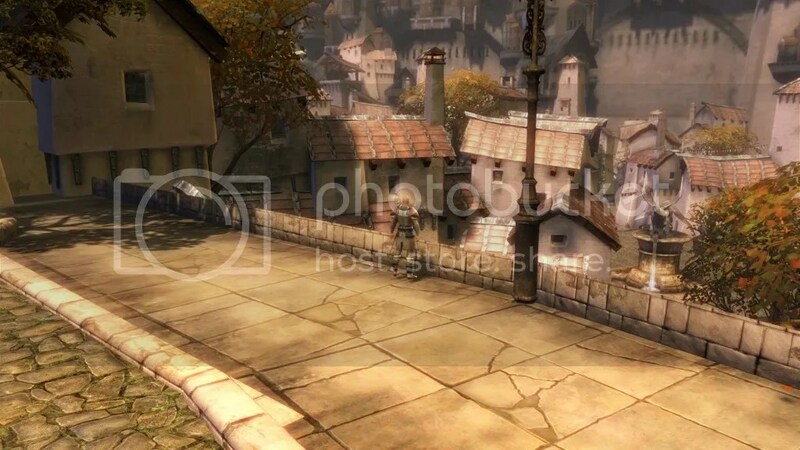 From a player standpoint, large cities in RPGs tend to disappoint, and that was true even in Guild Wars the first. They are generally full of buildings but not enough people, or you see places that you can’t get to, that you know were thrown in there just to make the place look big. Sometimes they get it right and the place looks alive, but feel? You sort of feel like a stranger watching life move around you while you stand still in this river of imaginary people. With Divinity’s Reach, however, the team at ArenaNet managed to deliver a bustling city, that feels alive, explorable, and filled with purpose, but also makes you feel like you’re part of it. Your character is greeted by strangers, for no other purpose than to greet him. I was surprised at first, and realized I may have been missing it every time it happened, but I looked down at the chat text at one point to see “The baker waves Jondular over.” Jondular being my character name, and the baker being the NPC (not 100% sure it was a baker, could not remember exactly who it was.) There are NPCs going about their day, talking with each other in voice, laughing, music, all the sights and sounds one would expect in a large city like this. I think the voice acting is what astounds me the most. Not all of it is great voice acting, it’s the shear amount of it that will take your breath away. I don’t remember the exact figures, but I do know that this game has more hours of voice recorded in game than several movies put together, and more than all but a couple of games. I think it might even be topped only by LucasArts Knights of the Old Republic. That’s not just story NPCs either, even NPCs who are there only for show, have conversations with each other that you hear when you walk by. One of the things that I always loved about Guild Wars was the way the horizon, and scenery, went on for realistic distances. 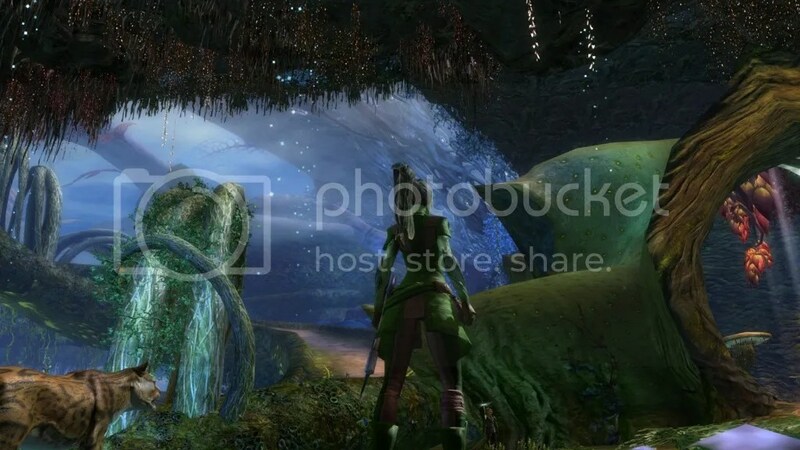 A lot of games favor fog, or blurring, or simply fading it away, to save resources, but ArenaNet has manage to, yet again, deliver on a concept that makes Guild Wars relatively unique. As you can see, when you are in game, you can see! The scenery on your screen will be displayed realistically, for distances that you would actually be able to see in life. 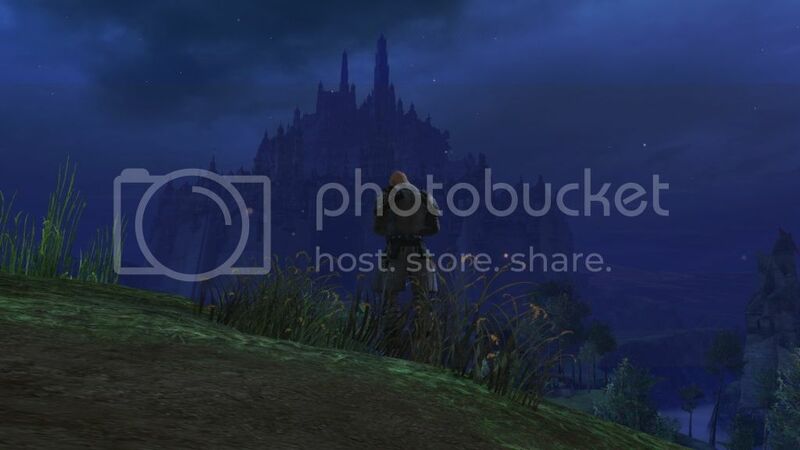 The city of Divinity’s Reach in the screenshot there, is a ways away from me at that point, still on the same ‘map’ but a good distance. You can also see, there’s a very good level of detail from such a distance. What you can’t see, but I can assure you, is that they stuck to their promise that Guild Wars 2 would be accessible to players without killer PCs. My PC used to be killer, say 2 years ago, but now it’s fairly average as gaming machines go. Still got a lot of years in her but no beast compared to others. I did not notice any lag, slowdown, framerate drop, or other problems one might expect at high settings in a game that is so graphics intensive. The developers have done a good job making this game efficient with the resources it does use. Being able to jump and climb, not only adds a new dimension to combat and tactics in this game, but it also allows access to some pretty impressive vistas. Here, my Char is up on a ruined wall that has fallen part-way over, leaving an inclined ramp of crumbling stone, that I could JUMP! up onto and climb to the top, giving this great view of the Char starter area. Again, the level of detail in the distance is amazing, but at this point I’m too busy imagining all of the things that could be done with this new feature, completely absent from the first game. Pinning enemies in a narrow passage while your allies climb up on the rocks and jump down on them? Leaping across cat walks to attack archers that have your comrades pinned? (I did that by the way, it was pretty epic feeling) Needless to say, I spent a lot of the day seeing what I could climb on, which will be evidenced by a the next screenshots. 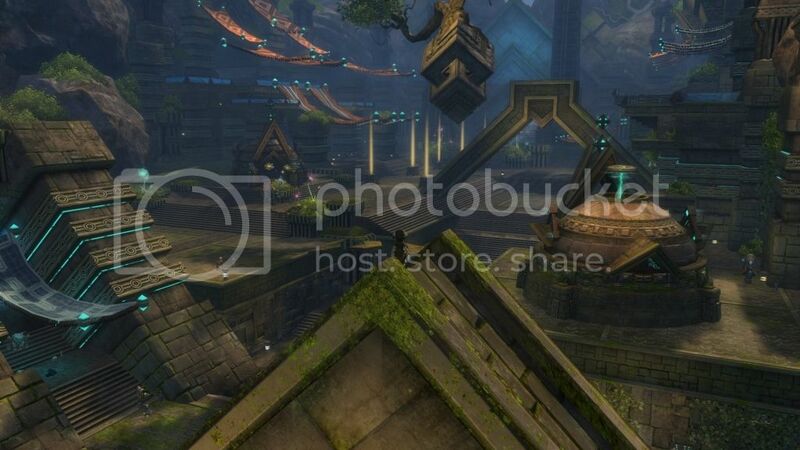 You can see in the Asura area, they take elevation to a while new level, which will only make the ability to jump that much more important. A lot of the areas you see, above and below you, are accessible in some way. These floating rocks are all over the place in the Asuran area, something that was only hinted at in the original game, but due to the limitations of the game, inaccessible. You can barely see Peggle, my little Asuran thief there in the middle, but shows that these areas are now open to players since you can jump. It’s amazing how much a simple little feature has completely changed the look and feel of this game. 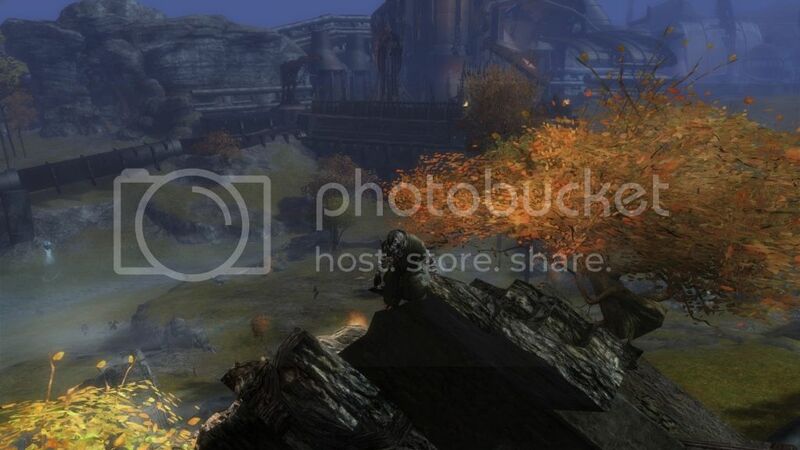 It’s going to make exploring Tyria much more exciting, and time consuming, but not in a bad way at all. As for the Asura themselves, at first I wasn’t too sure about them. Sure, they did a good job selling them in the previews, using Felicia Day’s voice, what geek in his right mind didn’t hear her voicing a character say “I want to tap…play that!” (No offense Miss Day, please know that we, at Frags and Beer, admire and cherish your contribution to gaming and the entire industry. [Think that’s good enough to ensure the above comment won’t ruin future chances at an interview for this publication?]) The Asura were annoying in the first game, not well fleshed out, and very alien. They just didn’t seem to fit in the fantasy setting. When they were announced as a playable race I preemptively wrote them off as something I wasn’t interested in. To give you all a complete view of the game though, I made a character, and I have to admit I found myself impressed. The faces, while sometimes cutesy, have serious options too. Believable serious options at that. It’s easy to envision a gritty, veteran asuran warrior, back from fighting in the wilds, complete with a grim expression and demeanor. 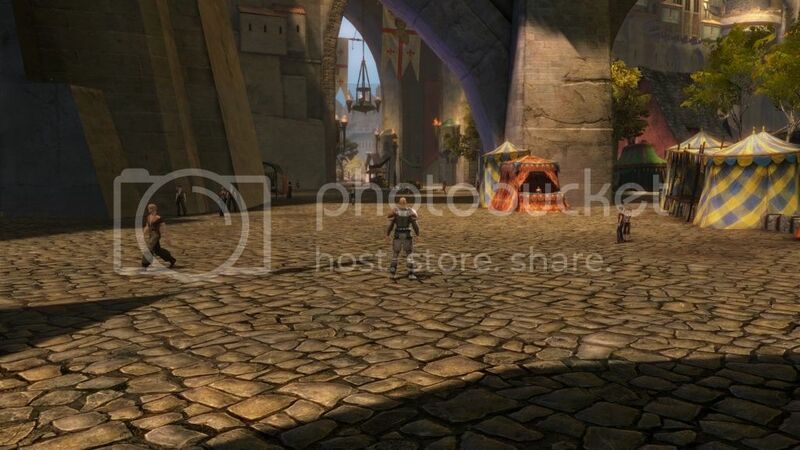 I’m sure there will be plenty of ‘cutesy’ asura running around, but it’s good to know that it’s not the default. As you can see, they also did a much better job depicting the asuran culture with their city on the right. It’s still somewhat ‘alien’ and all, but it fits Guild Wars now. Finally, I dropped in on the Norn again, making a ranger this time. This is probably going to be one of my characters for the main game. I stumbled upon this rocky outcropping that I missed during the first beta, and found this spirit wolf up there. I just had to get a shot of it and share. While it doesn’t show much of the landscape, or combat, or any of the bells and whistles, I think it’s just a cool shot. The wolf is one of the animal spirits the Norn worship, naming their clans after the beings. As your Norn rises in level they will be able to shapeshift into one of these animals, depending on the animal clan you pick at the beginning. I’m going to go with bear, probably influenced by the first game. So far my only critique of this area, and the game for the most part, is the male norn forms. To me they all look like tall dwarves (fantasy dwarves that is), too wide, legs too short, arms too long. The female forms are much better in proportion (not that kind of proportion…though those are nice too!)! Other than that, overall my beta experience was fun. I’m very excited to get the game, get into it, help my wife learn the ins and outs of the game, and spend a few years exploring the world of Tyria. I hope to see you there! Oh, by the way, Frags and Beer, hopefully, will be making its permanent home in the world that was created by ArenaNet as a tribute to a fallen gamer. For details check out our last post about the beta here, featuring this sad, but uplifting story. Frags and Beer is open to guest writers now. If you have a geek-themed article you’d like to see published, email us at magus_taliesin@hotmail.com and we’ll take a look at it. Look back through our posts to see what we mean by the theme. Nothing pornographic, too adult, political, or religious please. 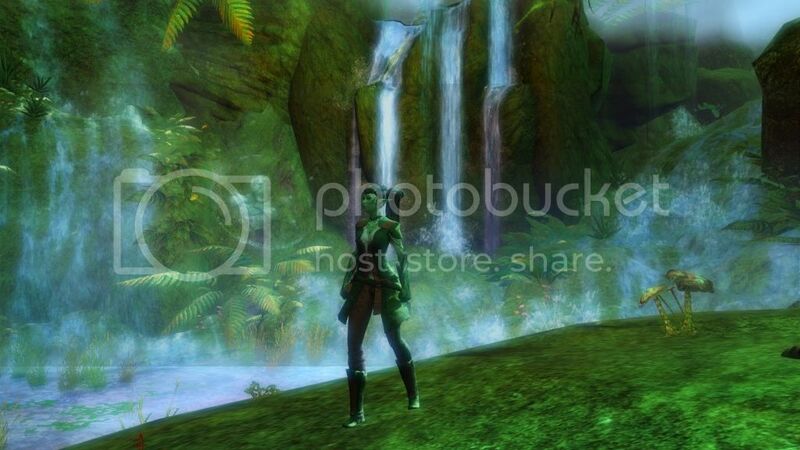 Last Guild Wars 2 Beta before release! The long-anticipated time is almost upon us. 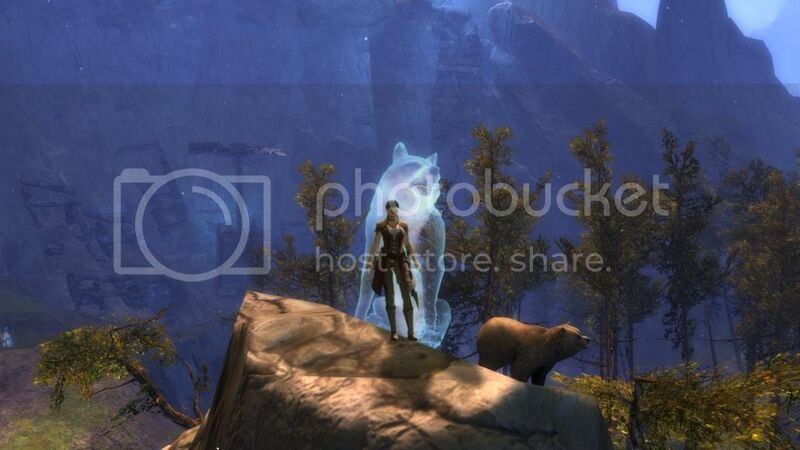 Guild Wars 2 has a release date, August 28th, and we are now one day into the last beta event before we get the goods. I didn’t get a chance to play it yesterday, but now it’s Saturday morning, the house is quiet, the air is still…almost like the morning right before a huge battle…and I’m downloading the update! Sorry, that’s not a critique on Arenanet, I’m glad it’s a lot of files, that means a lot of content to explore. I was just trying to build up drama and all that. Don’t mind me, I haven’t finished my coffee for the morning. I’ve already participated in one beta and I was blown away. Despite the bugs and problems that needed work, the game looked and felt so good. If you were a fan of the original and you haven’t picked up your pre-order then you are simply crazy. If you like RPGs, MMOs or online games at all you should at least be checking this out. Find someone that owns it, get over to their house this weekend and demand they show you! Trust me, from someone that got in on the first one late in the game, you do not want to miss out on playing this game from the moment it’s available. All right, files are downloaded, logged in and getting into character creation. This process is so much more complex than it was in the original game. Not only do you get to choose the typical height, weight, hair and eyes, body type, and all the basics, they have added levels of detail to these that is just staggering. In face details, you can change the eyes, everything from eyebrow placement, to iris size, to width. You can change the nose in every dimension as well as that of the mouth, ears and chin. Back when they started talking about the character creation they said this game would decrease the chances of meeting another character that looks just like yours and they were right. Then you dye your armor, and move on to the next page of creation. I chose a ranger, so the next parts of creation deal with the class features. As a pet my initial choices are Moa Bird, Stalker (feline creature), and a fern hound. I’d like to see more choices, or, honestly, see them go the route the first game did and have you go find your first pet, but I am choosing the stalker. Beggars can’t be choosers…well in this case I get to choose, but you know what I mean. Then it’s onto backgrounds, these determine how your story goes I believe, we’ll see when things get rolling. I chose ferocity for my character’s first background trait. For the next trait they ask what quest your character dreamed of, I’m going with The Green Knight, it seems to hint at perseverance and fortitude. Next it asks me what is the most important of Ventari’s teachings. In the game Ventari is one of the fictional characters from the original game, a wise old centaur…I’m going with “Act with wisdom, but act.” Finally it asks me when my character was born. 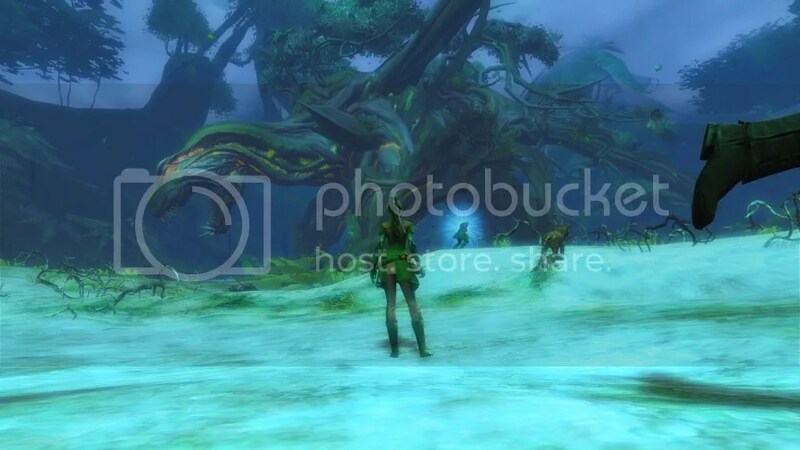 Sylvari are born from a being called The Pale Tree. 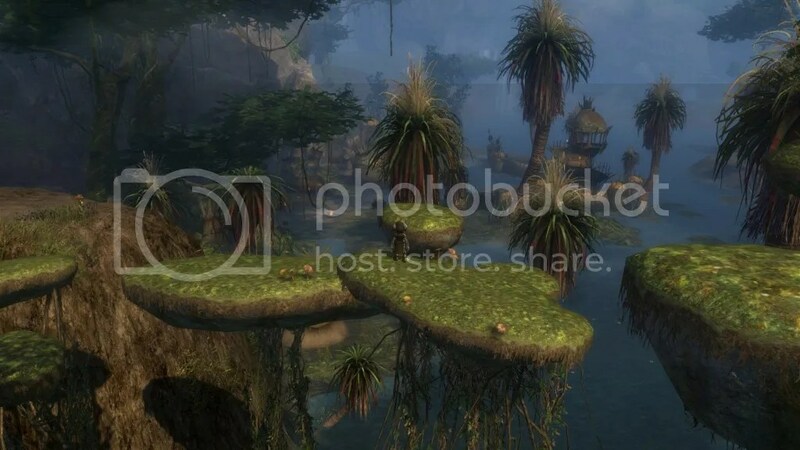 The time of day your Sylvari was born in determines their nature, and the ‘court’ they belong to among this culture. I am liking Cycle of Night, secretive and cautious, and independent. As I think I covered in the last beta discussion, Guild Wars 2 handles introduction to the game in a much different way than it’s predecessor, or really any other RPG’s that I have seen. After your character creation, and watching the little cinematic, which was great by the way, you pop right into a living world full of people talking, sounds, sights, and immersion. You are asked, by someone close, to come over for a chat, and away you go. There’s no tutorial level, no floaty question marks or exclamation points, and no quest boxes asking you to accept or decline. You listen to the story the speaker gives you and if you want to do it you go do it, if not, you don’t. The first person you talk to, if you respond to the summons is Caithe, from the introductory movies. I chose to follow this first path in my character’s story, going off to find some poison in the woods, but first, we had to fight some hounds. That done we moved on, and finally came to the scene of the trouble. Once there a small cinematic played, and a massive, tree-like dragon, pulled itself out of the forest floor, and it was time to have some fun. What you are seeing there is a quick cap I took of the dragon after it came out of the ground. This is actually the second one I took, in my haste to get a good shot and then get into the fight. That thing is simply huge, much larger of scale than anything we saw in Guild Wars. There were a lot of people around, not even a single person actually in my party! Just people who were close enough to see the fight start and come running to help out. It was a challenge, fun, and wow, the imagery. I’m a big one for graphics, between that and sound, that’s all you have to immerse yourself into a video game. Your other senses are useless in this type of experience, so I’ve never understood why people claim that graphics aren’t important. Sure, story is too, but something can have the most amazing story, and be crap to look at. If I want story there are hundreds of books in my library to read, I want the full package when I play a game. On top of the great action, the ease of play, and the great interface, Guild Wars 2 has great sound. All of the effects are great, but in the long term, music is what captures me in a game. It’s the times where no action is going on, when you are just taking it all in, that the music matters the most. Running through the initial areas of this game I was so engaged by the music. So far, great fun. Stay tuned for more updates all weekend. I’m going to jump back in and create a different character, throw you some more screenies, and learn more about this game. Until then, I will leave you with this show, one of my favorites so far. As some of you know I am looking to become a professional author, generally defined as an author that gets paid for his work, but I’ve always said I’d be happy just to see my name in print under a publisher other than me. I’m not picky, I just want to be able to go to a newsstand, bookstore, or online media that I don’t produce, and see my name attached to something I wrote. Now, as I wait for a response from my last hope to get my first fully finished short story into a magazine, I’m trying to wrap my brain around the realization that I might have to do something that grates against my old fashion ideas about writing. I might just have to convert it into an e-book format *shudder* and put it up on Amazon! I had previously told myself, if Wastelander (that’s the title of my short) is rejected by this last chance, ironically the magazine is called The Rejected Quarterly, that I would try to shop it as a graphic novel. The drawback to that is it would have to be rewritten into a comic/script-like format, taking me away from other writing projects. On top of that I would have to convince a company to take the story, and find me an art team to finish the book. Not many comic writers break in without having previous work, or already on a team with an artist, inker, colorer, etc. It would pretty much be more of a long shot than trying to get it into a magazine. I also don’t want to revisit this story if I don’t have to. It’s finished, and as just about every writer can tell you that’s a hard thing to do, call a work done. They want to go back and tweak and polish until the end of time but you have to just finally say “It’s done!” Well It’s Done! So, this leaves me with a connundrum. I want to get this story out, I want it available in as wide a blanket as possible, and I am not yet ready to just post my stuff willy nilly online for free. It can hurt your chances for future contracts on the work, should someone like it. It also tends to get nasty when someone develops a fan base on free stuff, and then decides they want to start providing for their family using their talent, and tries selling stuff. All of a sudden your fan base gets hostile and words like ‘sell-out’ and ‘mainstream’ get thrown in your face. I’d rather avoid that if I can. So, at the end of the day, I think I’m going to play with the idea of following in the footsteps of MP3s and microtransactions. Maybe not a new concept, but hey, if someone is willing to pay 99 cents for a 90 second song, why not 99 cents for a short story? It will sure last longer, and hopefully be more entertaining. Amazon allows authors to sell their work on the site, I just have to convert the story into an e-book format and put it up. I’m thinking .pdf so that just about anyone can access it, I’m not a fan of the proprietary e-book software that everyone seems to use. Maybe when these companies get over themselves and come up with a generic format I’ll jump on the e-reader bandwagon. Anyway, you’ve listened to me ramble about this for long enough I think. Hopefully a little peek into one of my other hobbies was interesting enough to get to the end of this post, because now I’m going to share an opportunity. I would like Frags and Beer to be something like an online gaming magazine, offering articles to readers one at a time, as often as possible, basically giving them more than a magazine’s worth of content every month. For free. (Yah I know what I said up there). Anyway, if you would like to write an article for us, please feel free to submit your piece to us at my email: magus_taliesin@hotmail.com. I’ll look at it, probably proof it, maybe get back to you for clarification or editing, and if it fits the bill I’ll post it with your credit of course. Obviously there isn’t any pay for this, we don’t charge for the blog. So, requirements? Post length should be reasonable, we don’t really have a short or long limit yet. Should be geek-esque in nature, take a look at the site to see the kinds of things we post about. Also, nothing profane, too adult, pornographic, religious or overtly political. If it fits a category we’ll toss it one. If it needs a new category, or you are a recurring poster, we’ll give it one. Well, that’s it for now, stay tuned for another look at Planetside 2, more Zombie Watch, and a couple of Pointless Geek Debates in the cooker. Until next time. The timing of this post really has nothing to do with the upcoming release of Batman: The Dark Knight Rises. It has more to do with a debate I read about which Joker was better, and someone saying, I kid you not, “You only like Ledger in that movie because he died.” Really, no kidding. Someone actually said that to me. I was stunned. Anyway, let me first say I’m a huge fan of both Jokers and both of the versions of Batman they come from, and that’s key to understanding why this debate is pointless. I grew up watching reruns of Batman on TV, reading some of the 80’s comics, and had probably one of the best comic runs of Batman in my opinion, Batman: Legends of the Dark Knight (I know, everyone says Miller’s The Dark Knight Returns is the best, but I wasn’t collecting at that time). First we take a look at Jack Nicholson’s Joker, from the Tim Burton film Batman. The film itself, was an updated, and darker version, of the classic comic books and shows. Violence was relatively tame, the darker elements of the Batman story were kept fairly light-hearted, and the action was what one expects from a super-hero movie of the time. I have to say I thoroughly enjoyed this movie. Michael Keaton was great as both Bruce Wayne, and Batman, and the chemistry between Keaton and Nicholson made the conflict between their characters fun to watch. 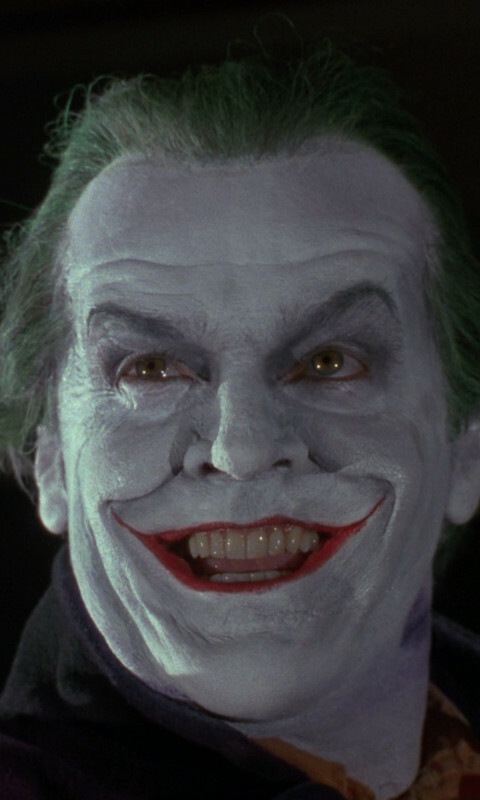 As far as Nicholson goes, playing the Joker, well it’s Jack Nicholson. I don’t think I’ve seen a single role of his that wasn’t fantastic. 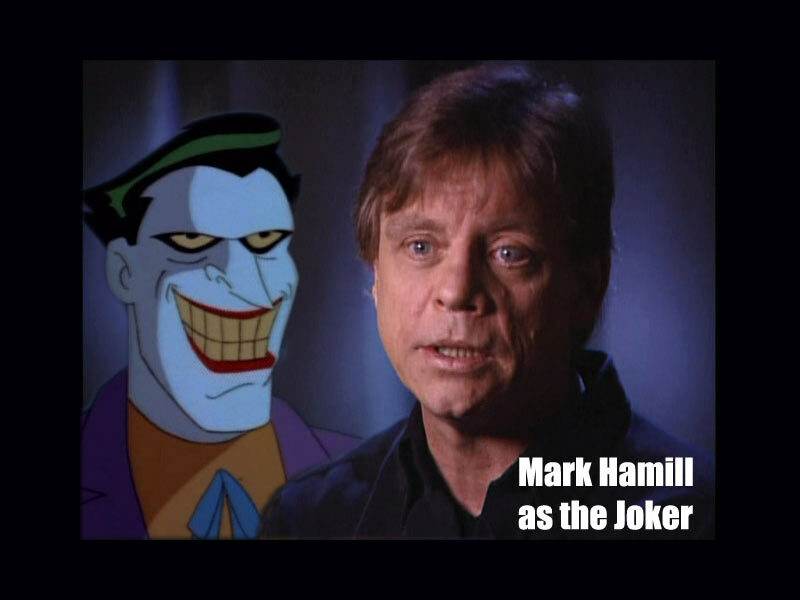 He brought the sadistic, humorous crazy that is that version of the Joker. There really is no comparison for this version of the Joker in live-action film or TV. Remember that, this version of the Joker…live-action. Now, we move on to Heath Ledger’s Joker. As seen in Batman: The Dark Knight. Chris Nolan brought us a much darker version of Batman with his trilogy of movies. His remind me more of the darker spin-offs of the Batman comics, and nothing at all like the TV show or previous movies. The action is brutal, violent, and realistic. Nolan’s batman is presented in a much more real-world frame of mind, with a little less camp, and much more seriousness. These type of movies call for an entirely different version of the Joker. 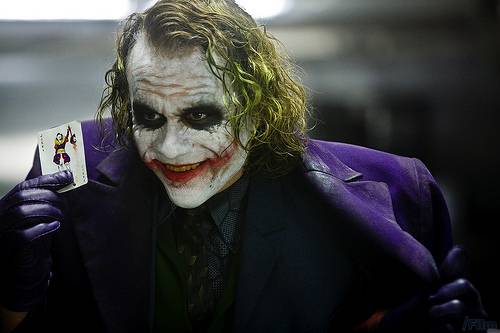 Ledger’s version calls to mind the Joker from Legends of the Darknight, or Miller’s The Dark Knight Returns. This Joker still laughs, but it’s not funny at all. He brings a sick and sadistic humor that makes you uncomfortable to laugh at. This version is completely different than Nicholson’s, but equally as brilliant. That’s really the core of why this debate is pointless. These version of the Joker are both totally different, called from different version of the Batman mythology, and protrayed in different ways to meet the needs of the film and story. They are both perfect for the role that they were playing, and both played by great actors. In both cases they made these movies what they were, and I can’t honestly think of better actors to have played them at the time. All that said, I think it goes without question though, these two were perfect for the live-action version of the Joker, but they both pale in comparison to this Joker.